Thanks to mobility scooters, people with limited mobility can have independence. Whatever it is that keeps you from walking, (age, mental capacity or physical ailments) mobility scooters offer means of transportation. With one of these, you can go through everyday tasks like shopping, running errands and even just to move around the house and yard. Whatever the limitation of your mobility is, we have compiled a list of the best mobility scooters that you might be interested in. These machines also provide mobility for anyone with disabilities; however, they typically have to be fitted by a trained professional. Mobility scooters are usually composed of four to five main components, including the frame, drive train and battery. Scooters are often similar in many ways, but their differences show in relevant sections like speed, capacity (weight) and battery life. Your individual needs will determine which features your scooter must have. When purchasing mobility scooters, these are the important features to focus on. The major considerations are performance, maneuverability, assembly, operating range and warranty. What the scooter is made of is relevant information, as different material will provide different mobility and transportation capabilities. We found out that the aluminum scooters are much lighter than a steel-made scooter and will be more easily transported. It is paramount for you to check for any and all safety features the scooter might have. Many scooters have anti-tip systems built into the wheels to help the user with inclines and sharp turns. Front wheel or rear wheel? You should make sure to check if the model you are after is a front wheel or a rear wheel drive. 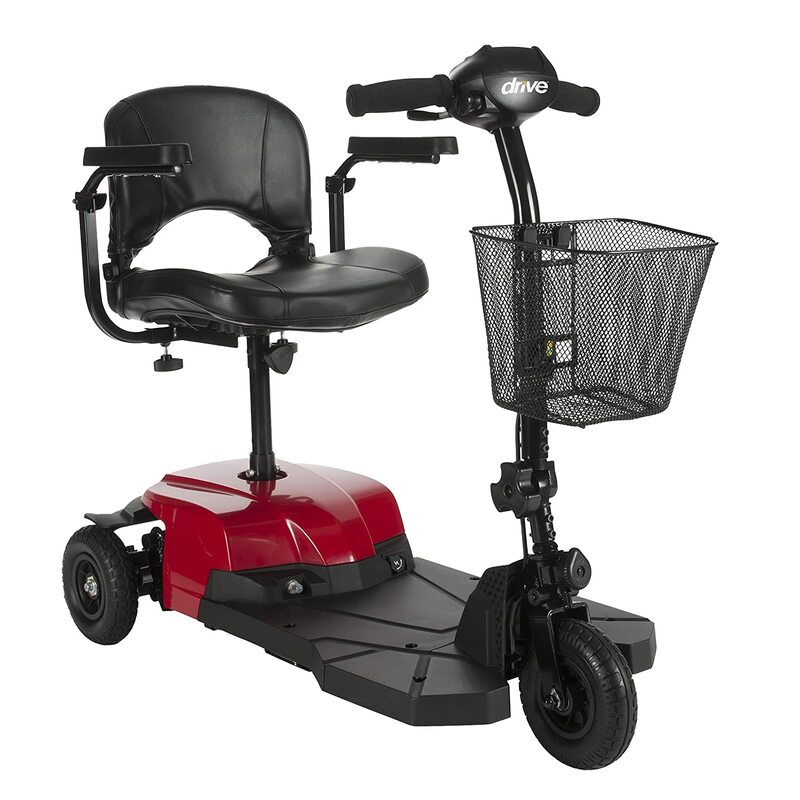 The front wheel drive models are usually smaller and lighter with a smaller turn radius but are limited for indoor use, while the latter group has a much better battery life and provide greater traction, making them perfect for outdoor use. Having good brakes on a scooter is very important for safety reasons. Rear wheel drive models often have electronic breaking systems that activate as soon as you stop using the throttle. Also, many models feature disc brakes cars and have a manually operated parking brake. The battery life of a good scooter cannot be over emphasized. Indoors models often have 12-volt batteries, which have shorter range but charge faster and are smaller. Outdoor models tend to feature larger, 24-volt batteries that offer more range, but recharge more slowly. It is also important that you recognize the type of battery you are using (integral or separate) because the charger will depend on the type. There are three types of tires – pneumatic (ordinary, air-filled tires), foam-filled tires and hard tires. Pneumatic tires are best used for outdoors, foam filled are good for both outdoors and indoors, require little maintenance and are a little on the expensive side, and hard tires are just for indoor use, and are quite uncomfortable, especially on uneven terrain, but they do not need any maintenance. Adjustable and comfortable seating is one of the things to consider, as you may spend much time in the seat. Accessories are also a thing to consider, as scooters offer a nifty housing for oxygen tanks, crutches, braces, etc. It is important that you buy a mobility scooter suitable for your weight because if you are too heavy for the scooter, it might become unstable. If you buy a scooter with a recommended weight capacity of lower than your actual weight, you will also invalidate the warranty. Moreover, so in our commitment to help you find the best mobility scooter that can help with your mobility needs, we have put together a review of 10 of our best in the market today. As versatile as it is stylish, the Bobcat 3-Wheel Scooter from Drive Medical comes with a spacious basket, is fully adjustable and features full-length flip back adjustable width armrests and a height-adjustable seat. Comfortable height adjustable seat with flip back, adjustable with arms. Top speed four mph. moreover, a cruising range of 7.5 miles. Comes with large carry basket. Comes with 2, 12Ah batteries. Drive's latest lightweight, transportable scooter is a perfect when it comes to comfort, performance, and value. It is the perfect entry-level scooter providing mobility that is comfortable, reliable and affordable to a wide variety of users. Available in both 3 and 4-wheel models, the ultra-lightweight Bobcat X also boasts a wealth of features that take it a step beyond basic transportation. Drive Medical's Bobcat X3 scooter is the ultimate lightweight, transportable scooter, featuring supreme comfort, performance, and value. The new Bobcat X3 is the ideal entry-level scooter providing easy-to-control steering power, and electromagnetic brakes for reliable mobility at an affordable price. 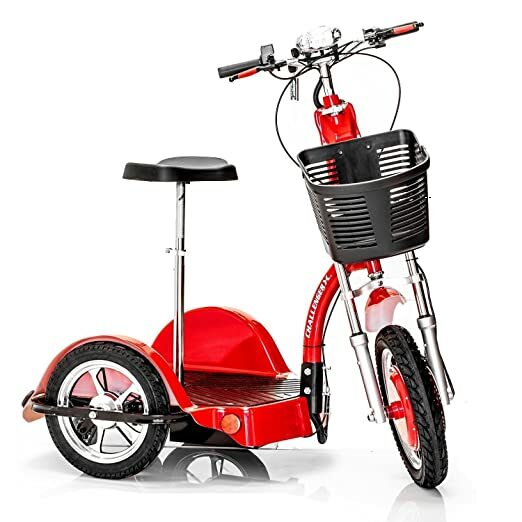 Feel confident traveling up to 4mph for up to 7.5 miles with 8" non-marking, anti-tip wheels and a large metal basket for conveniently storing belongings. The ultra-lightweight Bobcat X3 can carry up to 265 lbs, and the slim three-wheel design allows for tighter turning and easy maneuverability during both indoor and outdoor daily use. It lasts almost eight miles before recharging is necessary and can withstand up to 250 lbs. of weight. The batteries are loosely put together and not in a solid case for ease of handling. Easy to control steering power and electromagnetic brakes. This scooter is lightweight, airline friendly and easy to load in a car trunk. This new Transport Foldable scooter model has excellent portability or space saving. The Transport scooter allows you to drive into your home, fold the unit up and roll it into a closet or out of the way. Alternatively, if you are traveling, you can fold it and place it in the back of the vehicle in a one or two pie. Overall Dimension of 37" x 19." This scooter has two front-articulated wheels, giving them the appearance and maneuverability of a 3-wheeled scooter and the stability of a 4-wheeler. The EV Rider Transport collapses easily -- first, the backrest folds down, a latch then collapses the seat, and lastly, the front tiller post folds down onto the whole unit. The Transport is extremely light, weighing only 60 lbs. with the optional lithium-ion batteries. Note that it comes with SLA batteries. While the EV Rider bills itself as an indoor/outdoor scooter, optimal performance appears to be delivered on smooth, level surfaces like living room floors and putting greens. It is best to bring with during the travel. Its operation is based on power source from the SLA batteries. However, it is easy to connect and recharge it. Its powerful batteries will let this mobility scooter to drive up to 15 miles per charge. More importantly, it is on sale now. If you catch it on time enough, you will save much money. It has a very compact design, and after collapsing it, the user can wheel it into small spaces like closets or corners owing to its middle set of rollers. This feature is both unusual as well as useful. The Transport can carry up to 250 lbs. and is operated with the aid of a key. A speed control dial enables the user to handle the maximum speed of 4 mph better. It runs on a 270-watt, 4-pole motor, and has an adjustable-height tiller and anti-tip rear wheels. The Transport's maximum incline rate is 6 degrees, so mountain climbing is probably best avoided. The EV Rider can go up to 15 miles per charge. Available in bright, metallic Paradise Blue or Plum with silver accents, this scooter should make for a fun and comfortable ride; though there are user reports of breakage of the folding latch/handle. Easy to Lug Around at Home, Hotels or Airports. The seat has hard edges on both sides. Powerful 270 Watt 4-Pole Motor. This is a great scooter with awesome capabilities. It is an all-terrain vehicle, so you will be able to ride it over bumpy roads, ground, grass or even dirt. Wherever you need to go, this scooter will take you. Includes right and left turn signals, rear tail lights, front headlight, and front running lights and even reverse Tail Lights. The Hummer-XL is the upgraded version of the Tzora Titan scooter. Redesigned as a four wheel all terrain scooter, it has more stability than ever before. This scooter is meant for the long haul. Its design is catered to the more outdoorsy people but works just fine for indoor use. It easily separates into two pieces making it easier to transport when not in use. Scooters all over the country are designed with a center post for the seat to be attached. This becomes incredibly unstable on inclines due to the center of gravity. Tzora's easy travel scooters are designed with a four-post seat; this greatly improves your stability and safety with over a 45% increase in the scooter's stability. The folding design of the Hummer-XL gives you a portable vehicle that will take you anywhere you want to go. Even steep hills and inclines are no problem for the high-performance Hummer-XL. With full suspension, large tires and 22" wide memory foam seat the high-performance Hummer-XL delivers an amazingly smooth ride. The Tzora Hummer XL 4 Wheel Scooter offers excellent features, outstanding performance and plenty of flexibility on different types of terrain, making it a winner in the folding scooter category! The scooter has a 300-pound capacity, so it is very sturdy and powered by a strong engine. This engine will allow you to develop speeds of up to 6.8 miles an hour, so riding it is not a drag. The scooter’s battery life is expected to last for at least 15.5 miles. As for the seat, it is a 22-inch wide Com-Fort-Fit seat that is fully adjustable a positioned to your liking. It features a basket and a full light system so that you can ride it in the dark. Aside from that, a complete lighting system is also equipped throughout its body. Its maximum speed is 6.8 mph while per charge; it can run to 15.5 miles. So, for one-time charge, you can drive up around 2 hours. Has a speed adjustor on the dashboard. Not as quickly assembled as the rest of the items on the list. An outstanding all-terrain vehicle, very adjustable. Not good for steep hill and the seat does not swivel. Foldable design that separates into two pieces gives you a portable vehicle that will take you anywhere you want to go. 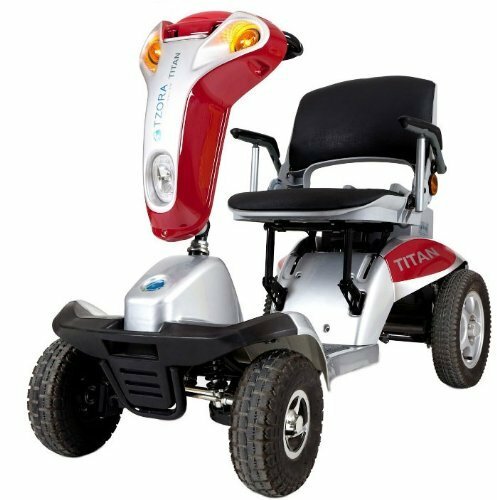 In the world of all kinds of mobility scooters, the Tzora Titan is well known for its high-quality portability and durability. It sets itself apart from other competing brands with a long list of useful features, from its lightweight design to its indoor and outdoor capabilities, making it very safe and very efficient. Also, it sports a modern and sleek appearance that conveys a strong sense of luxury and comfort. When considering a handicap scooter, it is important to factor in the scooter’s ability to disassemble for easy storage and portability. Sometimes you may not need to use the scooter and lack the room to leave it out, or you may need to transport it in a vehicle. The Tzora Titan offers the ability to quickly break down into multiple pieces that can even fit in the trunk of a sedan. Its heaviest part only weighs 49 pounds, making it easier for you to move and store. Because of the design, the risk of injury during breakdown is even minimized. The overall safety rating of this power scooter is high. The manufacturers have equipped the scooter with many features commonly found in a modern-day car. This includes everything from brake lights to reverse lights to the right and left turn signals. Each of these combines to lower the risk of accidents through your ability to communicate with pedestrians and other cars while traveling. The Tzora Titan is built for more than just indoor use and contains many features that make outdoor use safe and comfortable. It utilizes large rear tires to provide great stability, increased traction, and an overall smooth ride. When riding up an incline, the average scooter’s high center of gravity creates instability issues and a risk of tipping, but with the Tzora Titan, the unique four-point design offers more support and increases its stability by a staggering 45 percent. When shopping around for cheap mobility scooters, safety and consumer ease are top priorities to consider. The Tzora Titan offers features that increase both rather than forcing you to pick between one and the other. Thanks to its high-quality design and durability, this mobility scooter is safe yet efficient. 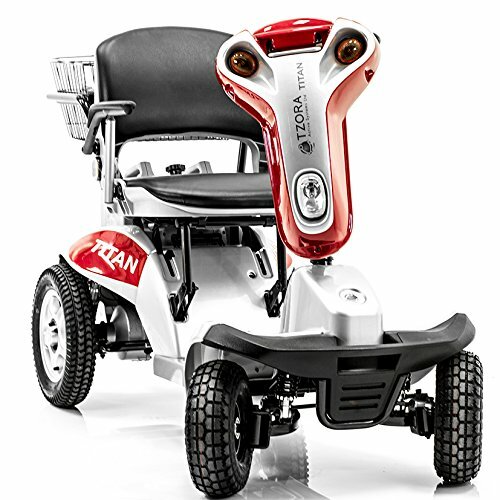 The Tzora Titan 4 Mobility Scooter stands at the forefront of innovation within the Mobility Scooter industry. It is a midsize mobility scooter that can be disassembled easily and transported in the back seat or the boot of your car. The range far surpasses that of other transportable scooters on the market, and the design and functionality of these scooters make traveling over all different types of terrain a breeze. Suitable for all terrains. It comes in rear drive only. Allows you to keep an independent, spontaneous and active life. Foldable and detachable in seconds without effort or bending! Compact, highly maneuverable, allowing it to be transferred easily into a car, a bus, a train or a plane. This is a great scooter for both fun and transportation. You will turn heads with the coolest scooter in town! This model features a variable speed dial for travel as slowly as one mph up to 18 mph, making it one of the fastest mobility scooters on the market - great for outdoor and indoor use. The EW-36 now has optional electromagnetic brakes giving the rider extra safety. A mode switch on the EW-36 allows you to switch back and forth between indoor and outdoor mode, with an indoor mode having a much lower maximum speed. New 2016 models come with an adjustable headrest. The EW-36 will go up to 45 miles on a single charge. 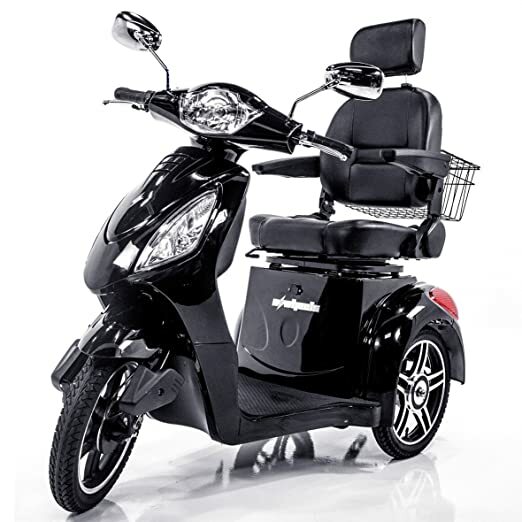 This scooter is loaded with features, including a very comfortable large padded seat, reverse switch, armrests, headlights, a large storage basket & more. The EW-36 comes equipped with a digital anti-theft alarm and two rear shock absorbers on the frame. Weight capacity: 350 lbs. The EW-36 comes fully assembled on a pallet. Just cut the straps, and it is ready to ride! Locking storage under seat. Without the brake, it is dangerous. This Pride Mobility scooter will truly make you ride it with pride. It offers excellent performances and great comfort even for longer trips. The scooter features an easily chargeable and durable battery. The battery offers up to 18 Ah of life, ensuring it will not die on you in the middle of the street or park and leave you stranded. This scooter has great weight capacity, being able to carry a weight of up to 325 pounds. It has a comfortable speed of four miles an hour. It features an adjustable seat, padded and with padded armrests of your convenience, making it great for longer rides. The scooter is also very light and easily disassembled and reassembled, so you can pull it apart and put it in the back of a family car with ease, making it very easily transported from place to place. Very portable scooter. Light assembly required; you will need to put 5 pieces together to make it work. The Go-Go modeled Ultra X-3 Wheel instead is best known for its lightweight. By and large, it is also one of the best-rated mobility scooters available on the market. After purchasing, it will come with 5 pieces in a big container, and it is easy to assemble. You can assemble it by yourself without any problems. Includes Vidacura's exclusive 5-year Extended Warranty even on the batteries. Breaks apart into five light-weight pieces. The largest piece weighs just 28 lbs. Flat-free wheels for a worry-free ride. The Go-Go Ultra X is loaded with design features like an innovative locking mechanism that allows one-handed frame disassembly and a convenient drop-in battery box that makes transport and travel worry free. The Go-Go Ultra X delivers these features and more along with the performance you expect from the first name in travel mobility, making it the ultimate travel scooter value. This scooter from VidaCura includes VidaCura's five-year extended warranty. 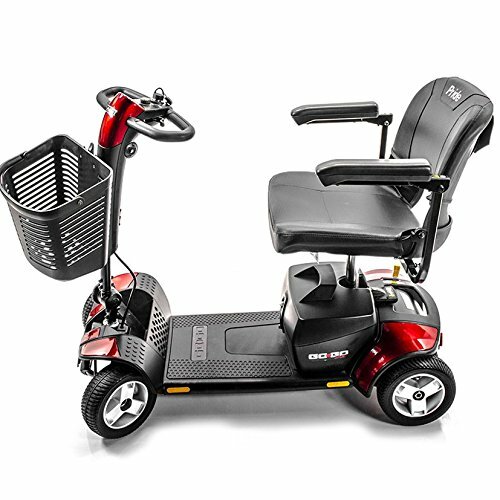 Five-year warranty includes batteries, battery charger, wiring, joystick, motor/gearbox, brakes, controller, PC board, throttle, tires, metal connection pins, hardware, nuts and bolts, fuses, light bulbs, bearings and bushings, seat swivel mechanism and armrest. The scooter has a luxurious deep-cushioned stadium seat that folds and can be stored in small car trunks. It also has delta tiller handles that offer support to riders with limited hand dexterity. This electric mobility scooter’s weight capacity is 260 pounds, so it can comfortably fit most users but is still limiting. With an adjustable tiller and arm rest, you can customize the scooter to fit you best. It has a drop-in battery pack, which makes it easy to use and a good option for elderly riders. There’s also a convenient off-board dual-voltage charger you can use to charge your battery pack on- or off-board, so you do not have to unload your scooter from your vehicle or its storage spot. The scooter takes between eight and 14 hours to charge. With a short operating range and a long charge time, this scooter performs best on short errands or driving around the house. The power scooter’s turning radius is 33 inches, which means it can turn virtually any corner, and with a width of 19.5 inches, it can fit into most tight spaces inside your home. Its maximum speed is 4 mph, which is fast enough to use indoors and on short trips around town. You can travel about 8 miles per battery charge, so if you rely heavily on your scooter for long-distance outdoor use, consider whether this is a large enough range. Pride Mobility includes a standard warranty for this scooter. The frame is covered for three years, while the drive train and electronic components are covered for two years. The company also provides a six-month warranty on the scooter battery. It is very tech friendly and easy to assemble. This scooter can only travel 8 miles on a single charge. Assembled, this scooter only weighs 75 pounds, making it easy to transport. This scooter is a three-wheeled scooter that’s designed for either seated or stand-up use. The challenger scooter trailer is a sturdy transporter, versatile in its use - appreciated among scooter riders. This challenger scooter trailer is the perfect solution to transport most items scooter riders should ever need. It has 88 lbs. loading capacity, and a large cargo volume. The scooter trailer has a red removable top cover that prevents theft. Many scooter trailer owners use it to store their personal items such as a purse, coat, books, laptop, weather canopy and many other personal items. The 16″ x 1.75″ solid nylon pneumatic tires give the scooter trailer a smooth, gentle ride when pulling with your power chair or scooter. The scooter trailer comes with all the hardware needed to easily attach to your power chair or scooter rear seat bracket. The challenger scooter trailer is the perfect size, as it is large enough for shopping, hauling or carrying your personal items yet small enough for making those sharp turns and fitting in small confined places. The scooter trailer is great for any size scooter or wheelchair whether it is a lightweight, portable scooter, a large heavy-duty scooter. The hardware included makes it simple and easy to attach it to your scooter seat bracket. The scooter trailer is also equipped with reflectors making it easier to see at night. It has a sturdy powder coated steel frame and comes with an easy removable transportation box made from shock-resistant recyclable plastic. Made of powder coated steel frame. Easy to assemble - not a complicated build like other brands. 16" pneumatic tires with nylon rim 70-liter removable transportation made from shock-resistant recyclable plastic. Removable cover for transportation box scooter trailer & hand wagon 2 in 1. Front tiller folds up for easy transportation. Unsuitable for rough terrain. Sleek and sporty design. Lack of suspension from the back means it is not such a good idea to ride this standing up over bumpy pavements or at high speeds. The Luggie Scooter is a one-piece folding scooter that is extremely portable and convenient. It travels for a decent distance on a single charge, has an acceptable maximum speed and maneuvers well. We love its lightweight design, easy maneuverability, and excellent performance. Reverse capability makes the Luggie even more maneuverable in tight spaces. Like most power scooters, the Luggie has a maximum speed of 4mph; you can make turns comfortably at this pace. This scooter does great outdoors and can go up to 12 miles on one charge. The battery only takes between two and six hours to recharge, which is the fastest advertised charging time of the scooters in our review. The Luggie’s performance falls short with its light carrying capacity. Its maximum weight capacity is 250 pounds, limiting who can use it. Additionally, it does not have a basket or other storage option, although you can purchase one separately. If you like to travel light, then the limited weight capacity and lack of a basket will not be a problem. However, if you are used to carrying a lot, this is something to consider. The Luggie is compact and portable without sacrificing stability and durability. It is also extremely nimble. It boasts a 36-inch turning radius so that you can turn almost any corner. It also has rear anti-tip wheels that provide extra protection against falling over in the middle of a sharp turn. While it is not the fastest mobility scooter on the market, it can get you where you need to go safely and relatively quickly. 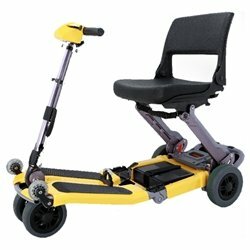 The portable scooter has a decent ground clearance so that you can drive over uneven surfaces. However, the scooter operates optimally on flat surfaces. The Luggie can climb a maximum incline of 6 degrees. With ADA compliant commercial ramps built at 5-degree angles, you can safely drive up most ramps. It comes assembled out of the box, so there’s no need to memorize which piece goes where. You can just take it out of the box, pull a couple of levers, extend its frame, flip a switch and you are ready to roll. Assembled, the scooter only weighs 50 pounds, making it an ideal electric scooter for seniors. 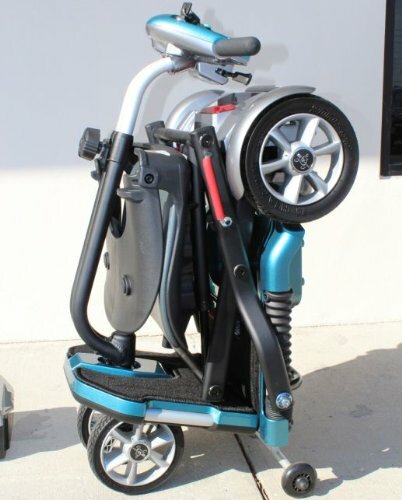 This scooter folds up into several configurations. There is the riding position where the seat and handlebar are upright, as well as a partially collapsed position that allows you to pull the scooter like a piece of rolling luggage. Lastly, there’s the fully collapsed cube, which you can use to easily store, stow and transport the electric scooter. If you put your scooter in the trunk of your car or check it as luggage on an airplane often, there’s simply no better scooter for you. This is truly its most useful feature. While the scooter’s compact size makes it easy to transport, you lose comfort for that portability. The Luggie’s lack of support can take away from the overall riding experience. 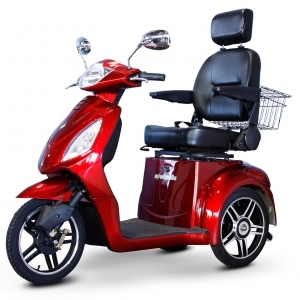 Additionally, the scooter does not have adjustable arm rests, so you cannot customize them to fit your body type. Luggie backs the scooter’s frame with a three-year warranty. The drive train and electronic components have a one-year warranty, and the battery is covered for six months. It easily expands and collapses for easy storage and transporting. It can only carry passengers weighing up to 250 pounds. The easy travel elite folding lightweight scooter is a lightweight, transportable electric mobility scooter that has a detachable battery that’s easy to recharge. Weight capacity 250 lbs. - Speed 3.7 mph - Heaviest Part 27 lbs. Elite Easy Travel Scooter has a unique In-Wheel-Motor design. Meaning, the motor is actually inside the front wheel. This is the only scooter produced that utilizes this technology. This design not only saves on space, but it also makes steering very easy and finally it eliminates weight making the Elite even lighter.This scooter receives great scores in portability, design, and performance. It can be conveniently folded to a similar piece of luggage for transport in your vehicle or even by air. It can be disassembled into three lightweight components for easier lifting, and the total weight without the batteries is about 58 lbs. It has no connectors, latches or mechanisms to open and close when taking it apart. The Elite was designed with the idea of enhancing your quality of life by enabling you to travel whenever, however, and wherever you want, without the restrictions of a larger and heavier scooter. This scooter is transported easily transported by car, taxi, train or plane effortlessly. One of its many features, the point design gives you about 45% more stability on inclined planes than a scooter that uses a center seat post. It is one of the most stable scooters due to its amazing engineering and four point seat structure. Most all scooters have a center seat post for the seat to be attached. 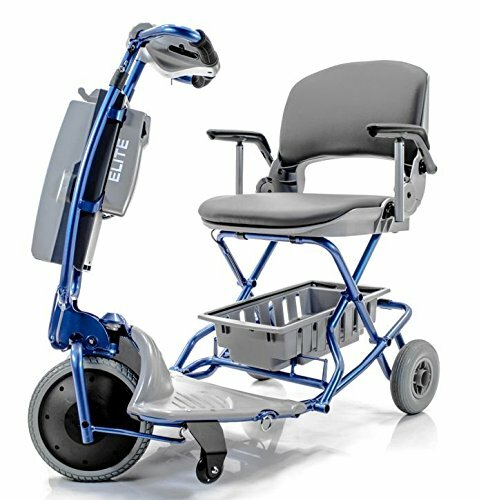 No matter what your movement limitation and needs may be, getting the right mobility scooter is a necessary purchase. If you have a disability or just have trouble walking, a scooter helps you get around and gives you independence. With a scooter, you can perform everyday tasks like shopping, running errands and even just moving around the house and with a variety of styles available, we hope you can find one that suits your needs and looks good too. We hope our List can serve as an informed a guide that will help you navigate through the thousands of products out there so you can come to a decision you are happy with in the long run.